Today I am sharing the first deep fried recipe on my blog. Yep you read it right...I meant deep fried. There are certain foods that taste best when cooked in certain ways and my family prefers the fried version of cutlets opposed to the baked ones. I am not sure how the baked version of vadas (lentil donuts) would taste; well there might be someone out there who might have tried it too. Baking is another option in the case of cutlets, if you could get the cutlets to bake uniformly, which cuts down the fat content. But hey....I don't make these all the time, it's when I hit a bad craving, I go for these cutlets. My family absolutely love this spicy snack. 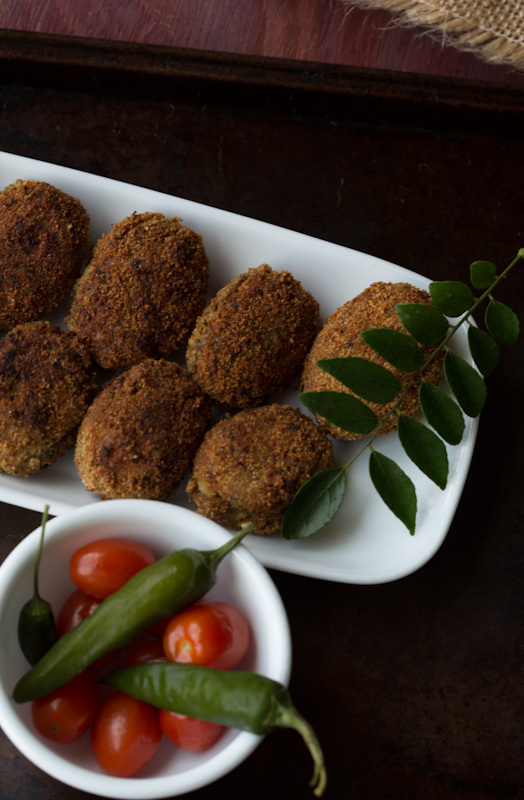 On a rainy day a hot cup of tea and a plate of these yummy cutlets make my evening perfect. I remember my Mom used to make beef cutlets by cooking the beef and mince them manually using a shredder when we were small. But she used to make fish cutlets too which was way much easier than the beef cutlets. Even though I was not a fan of fish when I was small, I loved fish cutlets. I had made chicken cutlets too during my initial cooking experiments, but my favorite is fish cutlets. Since I make only fish cutlets these days, I kind of imposed the taste on my family and they only like fish cutlets now :). I believe the taste palates of your family can be changed by the cook's choice. Nathan who is a big fish lover in our house reminded me of making these cutlets last week and I made these on the weekend for the evening snack. As usual I setup my photo shoot spot and camera ready for taking pictures. But there was something missing, so I went to grab some green chilies from the refrigerator, but when I came back, some cutlets were gone. I had to guard the cutlets for the photo shoot and direct them to the kitchen to get the cutlets from the other batch I made. Finally I managed to take few pictures!!!! These spicy cutlets are highly volatile :).. Drain the water from the canned tuna and squeeze out excess water from the meat using hands and keep it aside. In a non stick pan splutter 1/4 tsp of mustard seeds in 1 tbsp of oil. Add chopped ginger and garlic and cook till lightly golden brown, followed by chopped onions, salt and green chili. Let it cook till the onion is translucent. Add turmeric powder, garam masala, ground pepper and cook till the raw smell goes away. Add the drained fish meat and chopped curry leaves and cook for 3 - 5 minutes till the mix is well blended with fish. Now add the mashed potatoes to the fish mixture and check the salt and seasonings. Give a final mix and turn off the burner. Let the mix cool completely. Meantime mix well the egg whites using a fork till frothy. Divide the fish mix into 25 golf ball sized balls and flatten them into a round or oval shape. Dip the cutlets into the egg white mix and roll in the bread crumbs. 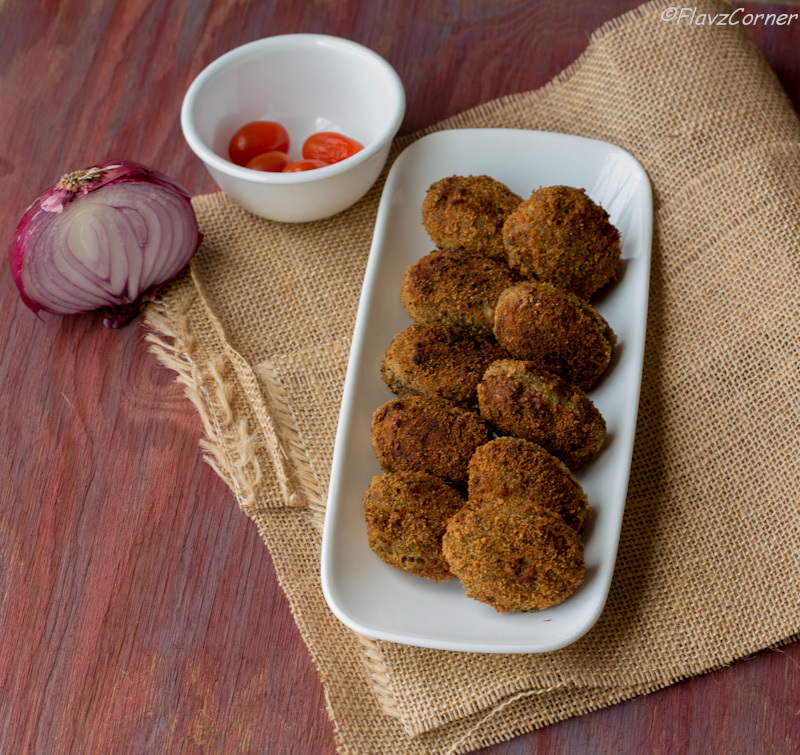 Fry the cutlets in a heavy bottom pan till they are browned enough to your desired color and crispiness. Drain the excess oil from the fried cutlets using paper towel. 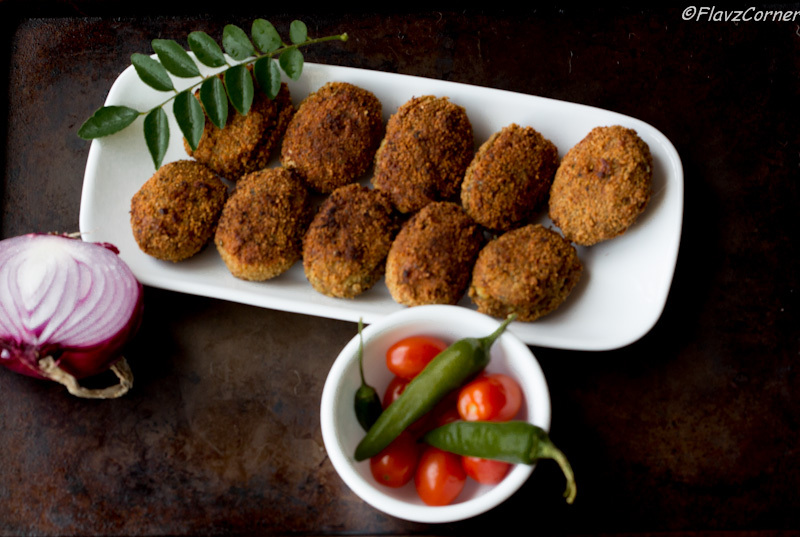 Enjoy the cutlets using fresh homemade salsa or ketchup. Make sure you squeeze out all the water from the fish, if you are using canned fish. The cutlets can be stored in air tight container in refrigerator for couple of days. If a big batch of cutlets are made, you can freeze them in ziplock bags. Thaw the frozen cutlets and use a toaster to warm them up. This helps to retain the crispiness of the cutlets. If you don't have a toaster, use a pan to warm them by flipping the sides to attain crispiness. Good nice to see the cutlets Shibi. I usually use fresh tilapia fillets and boil them with salt and pepper. I will also add some broken bread pieces too along with the potatoes, gives it a better binding. Good job there Shibi. Thanks for reminding me of these good boys. I use fresh tilapia fillets and boil them with salt and pepper. Also will add some broken or torn bread pieces along with the potatoes, gives a better binding. Thanks Sherryl!!! I had made cutlets with fresh Salmon too. Since the canned tuna is easy, for quick snack I prepare the cutlets with them. I will try with bread pieces next time. Thanks for the tip!!! Some foods taste really good only when they're deep fried! And done right, it's actually a reasonably healthy cooking method. These look terrific - a new way to try canned tuna (which I love). Good stuff - thanks so much.